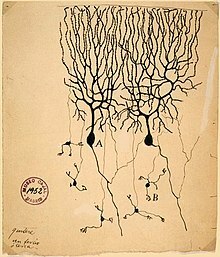 A neuron, also known as a neurone (British spelling) and nerve cell, is an electrically excitable cell that communicates with other cells via specialized connections called synapses. All animals except sponges and placozoans have neurons, but other multicellular organisms such as plants do not. A neuron is the main component of nervous tissue. Neurons fall into types. Sensory neurons respond to stimulus such as touch, sound, or light that affect the cells of the sensory organs and sends signals to the spinal cord or brain. Motor neurons receive signals from the brain and spinal cord to control everything from muscle contractions to glandular output. Interneurons connect neurons to other neurons within the same region of the brain or spinal cord in neural circuits. A typical neuron consists of a cell body (soma), dendrites, and a single axon. The soma is usually compact. The axon and dendrites are filaments that extrude from it. Dendrites typically branch profusely, getting thinner with each branching, and extending a few hundred micrometers from the soma. 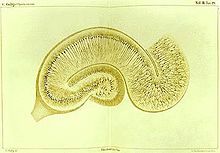 The axon leaves the soma at a swelling called the axon hillock, and travels for as far as 1 meter in humans or more in other species. It also branches, but usually maintains a constant diameter. Neurons can lack dendrites, or have no axon. An en passant bouton is a type of terminal located along the length of the axon. The term neurite is used to describe either a dendrite or an axon, particularly in its undifferentiated stage. In most cases, neurons are generated by neural stem cells during brain development and childhood.Neurogenesis largely ceases during adulthood in most areas of the brain. However, strong evidence supports generation of substantial numbers of new neurons in the hippocampus and olfactory bulb. The axon is a finer, cable-like projection that can extend tens, hundreds, or even tens of thousands of times the diameter of the soma in length. 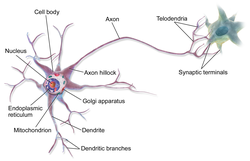 The axon carries nerve signals away from the soma (and also carries some types of information back to it). Many neurons have only one axon, but this axon may—and usually will—undergo extensive branching, enabling communication with many target cells. The part of the axon where it emerges from the soma is called the axon hillock. Besides being an anatomical structure, the axon hillock is also the part of the neuron that has the greatest density of voltage-dependent sodium channels. This makes it the most easily excited part of the neuron and the spike initiation zone for the axon: in electrophysiological terms, it has the most negative action potential threshold. While the axon and axon hillock are generally involved in information outflow, this region can also receive input from other neurons. Fully differentiated neurons are permanently postmitotic however, stem cells present in the adult brain may regenerate functional neurons throughout the life of an organism (see neurogenesis). Astrocytes are star-shaped glial cells. They have been observed to turn into neurons by virtue of the stem cell characteristic pluripotency. ^ Thorpe, SJ (1990). "Spike arrival times: A highly efficient coding scheme for neural networks" (PDF). In Eckmiller, Rolf; Hartmann, Georg; Hauske, Gert. Parallel processing in neural systems and computers. North-Holland. pp. 91–94. ISBN 9780444883902. ^ Burns A, Iliffe S (February 2009). "Alzheimer's disease". BMJ. 338: b158. doi:10.1136/bmj.b158. PMID 19196745. (Subscription required (help)).